The Climate series: a reference post. ▪ How close are we to catastrophe with global warming? ▪ How close are climate scientists to actually saying so? It's not just about the planet; it's about straight talk about it as well. And it's not just about the facts, but how they make us act. ■ The second question first, about climate scientists, from an excellent ThinkProgress piece called "Hug the Monster: Why So Many Climate Scientists Have Stopped Downplaying the Climate Threat". Climate scientists have been consistently downplaying and underestimating the risks for three main reasons. First, their models tended to ignore the myriad amplifying carbon cycle feedbacks that we now know are kicking in (such as the defrosting tundra) [defrosting tundra adds carbon]. Third, as Blakemore (and others) have noted, the overwhelming majority of climate scientists are generally reticent and cautious in stating results — all the more so in this case out of the mistaken fear that an accurate diagnosis would somehow make action less likely. So climate scientists are quiet for a number of reasons — they missed the feedback amplifiers like defrosting tundra, they didn't model the "do-nothing" scenario, and they're ... scientists, not loudmouth salesman-on-a-bender types. "Hug the monster" is mil-speak (heh) for embracing your fear and using it to spur action, not paralysis. Climate scientists are learning to hug the monster — as should we. ■ Now, about that "monster" — what does it look like? I want to go back to an important piece by James Hansen, head of NASA Goddard, that Chris highlighted a few days ago. For Hansen, "we" is the American government, meaning Barack Obama. For me, "we" is progressives, meaning actual us. The concentration of carbon dioxide in the atmosphere has risen from 280 parts per million [p.p.m.] to 393 p.p.m. over the last 150 years. The tar sands contain enough carbon — 240 gigatons — to add 120 p.p.m. Tar shale, a close cousin of tar sands found mainly in the United States, contains at least an additional 300 gigatons of carbon. 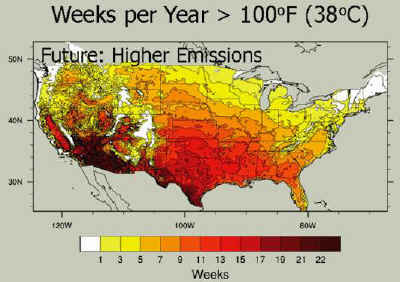 If we turn to these dirtiest of fuels, instead of finding ways to phase out our addiction to fossil fuels, there is no hope of keeping carbon concentrations below 500 p.p.m. — a level that would, as earth’s history shows, leave our children a climate system that is out of their control. I got the tar shale number by scaling up from the tar sands number. If burning 240 gigatons of tar sands carbon adds 120 ppm to the air, burning 300 probably adds 150 ppm. [T]he do-nothing scenario ... is a tripling (820 ppm) or quadrupling (1100 ppm) of preindustrial levels of carbon dioxide over the next hundred years or so. In the last 2 or 3 years, however, the literature in this area has exploded and the picture it paints is not pretty (see “An Illustrated Guide to the Science of Global Warming Impacts: How We Know Inaction Is the Gravest Threat Humanity Faces“). Click to big. That's weeks per year over 100°F. That red in California is the Central Valley. Don't freeze and don't panic. Hug the monster and act. Take progressive responsibilities seriously — which means, understand there's a deadline. And that means, don't be complacent about pressing Obama and the Democratic Party hard after the 2013 election debacle. There are about five deadlines like this in the pipeline, and the Dems are in the way on most of them. We might as well get used to pushing them. On each of these issue, including the climate, there's not a lot of time left for playing footsie with our social friends, career-building, and list-growing. You can preference careers and organizational lists if you want — just don't say you're committed to progressive values if you do. Remember — serving self and daddy is a conservative value. Serving others is a progressive value (in my opinion). On issues like this, you have to pick. And do take hope. It's not over, and there are a great many people like us, frustrated but eager to act. We just need a center, a seed. Maybe climate scientists saying the C-word, out loud this time, will be that seed. UPDATE: If the subject of climate scientists and what they go through interests you, tune into Virtually Speaking tomorrow evening (Wednesday, May 16, 5pm EST / 2pm PST). Click here for the live show, and here for the archived version. The guest will be Dr. Michael Mann, author of The Hockey Stick and the Climate Wars: Dispatches from the Front Lines. It should be a fascinating discussion.